your audio and visual rental needs. We provide audio and visual rental services, including technical support, to the Greater New Orleans and Baton Rouge area. 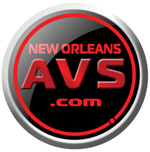 Let New Orleans AVS provide you with experienced professionals to ensure that your event is the best that it can be! NOAVS has affortable computer, laptop, audio visual equipment rentals to suit your needs. . Full-service meetings, trade shows, seminars, user conferences company. Full-service meetings, trade shows, seminars, user conferences, experiential marketing.